Coast Guard Intercepts Two Ukrainian Warships In Russia’s Exclusive Economic Zone Off Crimea – FSB 4.6666666666667 out of 5 based on 12 ratings. 12 user reviews. Two ships of the Ukrainian Navy have crossed into Russia’s exclusive economic zone off Crimea and are being escorted by ships of the Russian FSB Border Service’s Coast Guard, Crimea’s Border Service branch told reporters on Saturday. 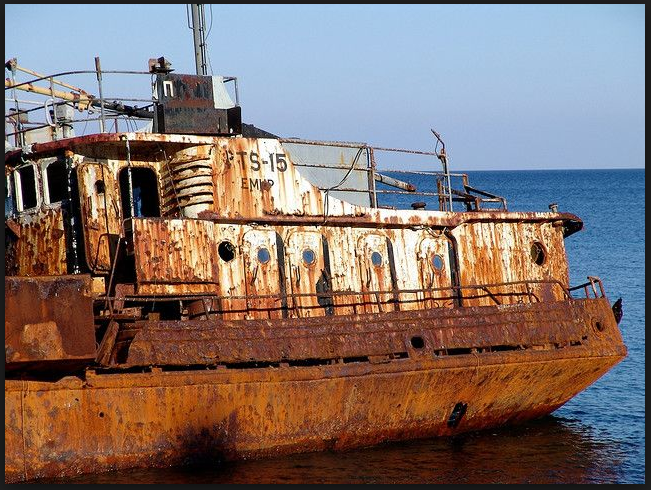 “At the moment, two ships of Ukraine’s Navy – the Donbas command ship and the Korets tug – are off Crimea’s coast, in the Russian exclusive economic zone, going in the northeastern direction,” says the statement. “In line with norms of the international maritime legislation and in interests of security of the Russian Federation, they are escorted by ships of the Coast Guard of the Russian Federal Security Service’s (FSB) Border Service,” it said. The border department has pointed out that the ships are escorted at a safe distance. The real question is if these two warships, and that’s an overly generous description of this pair, are headed for the Kerch straight bridge? A NE direction would seem to suggest so, at least so far. If that’s true what will the FSB do when they get there? If they intend to pass through they’ll have to proceed into Russia’s territorial waters. And with the current ship seizures issue and the threats to the Bridge will the FSB force both to stop for a search and to take on a maritime pilot, if permitted to pass? I mean surely Russia wouldn’t want a threat to the Bridge to pass under, or hit it. Especially with Russian motorists and citizens passing above? Both symbolic defiance and testing the Russian responses, I do wish they wouldn’t do this so often. How foolish of the Banderised Ukrainians to lick US/EU/NATO arse and mess with RF. The gangsters will not risk their own lives while they laugh at Ukrainians killing Ukrainians and now the risk of killing Russians. Yes and no. Russia has every reason to reject their passage by what essentially is a terrorist state. But on the other hand, perhaps they are playing along for a reason unknown to the rest of us. yes, oil prices and markets. Idiots and incompetents are predictable – do not expect their behavior to change anytime soon. the US puppets trying to test Russia’s tolerance in the area…. When ships enter Australian waters illegally, the ship is impounded, and destroyed. I think there must be some internationally recognised treaty to pass through another’s waterway to access their own. Not that it really matters in the case of Ukraine, Terrorist State. It seems to depend on muscle. Foreign ships cannot traverse American inland waterways without permission, but the US refuses to acknowledge Canadian inland waterways, and sends warships through, just to show the Canadians who is boss.